Serious discussions between the Nazi and Soviet regimes began secretly in late July 1939. On August 21 Ger­many announced that Foreign Minis­ter Joachim von Ribben­trop had been invited to Mos­cow. Two days later the world learned that Ribben­trop and his Soviet counter­part, Vyacheslav Molotov, had ini­tialed a non-aggres­sion pact (Molotov-Ribben­trop Pact) between the hither­to antag­o­nis­tic states. With the Soviets now neu­tra­lized, Adolf Hitler ordered his attack on Poland, planned since late March 1939, to begin on this date in 1939. But at the last minute, on the evening of August 25, he hesi­tated. The British and French govern­ments insisted they really would go to war with Ger­many if Poland were attacked—a mutual assis­tance pact had been signed that after­noon between Britain and Poland, a follow-up to a March 31 guaran­tee of Polish inde­pen­dence. Further­more, Axis part­ner Benito Mus­so­lini told Hitler that, not­with­standing their two-year-old bi­lateral mili­tary Pact of Steel, Italy would remain im­par­tial in any war with Poland. Faced with the pros­pect of taking on Britain, France, and Poland un­aided, Hitler decided to avert war for the moment in favor of a full-court diplo­ma­tic press. A Swe­dish emis­sary, acting in a pri­vate capa­city, shuttled between the Ger­man and Brit­ish capi­tals with vari­ous pro­posals for a peace­ful solu­tion to Ger­many’s dif­fer­ences with Poland over the Polish land corri­dor and the ethnic Ger­man Danzig en­clave (see map); both terri­tories had been a part of pre-World War I Ger­many. But the West’s last-minute hopes for a multi­lateral settle­ment were delu­sional. August’s shuttle diplo­macy was essen­tially stall tactics designed to drive a wedge between Poland and its West­ern backers. The Poles must be shown thoroughly un­rea­son­able by refusing to make con­ces­sions regarding an extra­terri­torial high­way link (the Reichs­auto­bahn Berlin-Königs­berg) across the Corri­dor that would elimi­nate the need for Ger­mans traveling between East Prussia and the rest of Germany to carry pass­ports. Also, Hitler did not truly want Poland to accept his demand to hand over Dan­zig, whose forci­ble sei­zure he had been plot­ting since late 1938. Hitler rescheduled his in­vasion (Fall Weiss) for Septem­ber 1. In his bones the scheming aggres­sor felt sure that the coming war would not spread beyond Poland’s borders. Above: Interwar land corridor to the Baltic Sea and the semi-auto­nomous “Free City of Dan­zig,” 1920–1939. Both crea­tions were carved from for­mer Ger­man terri­tory (West Prus­sia’s cen­tral parts) so that newly inde­pen­dent Poland would not be depen­dent on Ger­man ports for its import/­export trade. 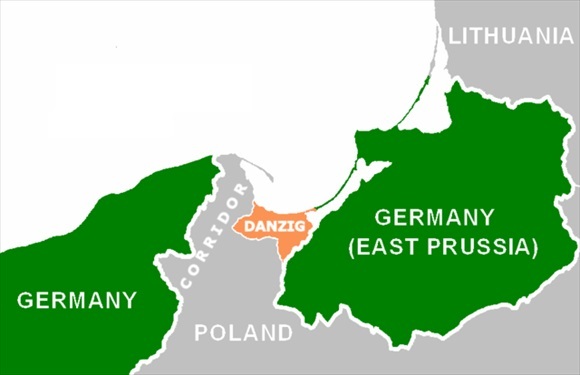 In May 1933 Hitler’s Nazi party gained con­trol of the Danzig Senate. Like the ethnic Ger­mans in Czecho­slo­vakia’s Sude­ten­land in the mid-1930s, Dan­zig’s largely ethnic Ger­man com­munity strongly agi­tated to be incor­porated into the Fatherland. 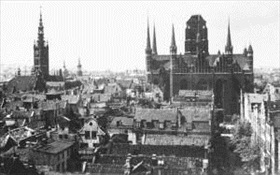 Left: Danzig’s St. Mary’s church (German, St. Marien­kirche) and the Green Gate built to serve as the for­mal resi­dence of the Polish monarchs. In 1224–1225 Ger­man mer­chants from Lue­beck estab­lished a pres­ence in the area. Signi­fi­cant Ger­man influ­ence appeared in the four­teenth cen­tury after the take­over of the city by the Teu­tonic Knights. In 1793 Dan­zig was annexed by the King­dom of Prussia and became the capital of the Ger­man pro­vince of West Prussia. It remained a part of Germany until 1918, after which it was admin­is­tered by a League of Nations com­mis­sioner and elected assem­bly. 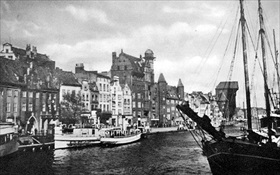 As a result of the Pots­dam Agree­ment of 1945, Danzig (Gdańsk) became part of Poland. 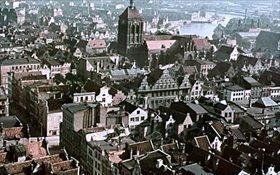 Right: Danzig’s city hall (left in photograph) and St. Mary’s Church from the back. Begun in 1379, the Roman Catholic (formerly Lutheran) church is the largest brick church in the world. The church was badly damaged during the storming of Danzig city by the Red Army in March 1945. Recon­struc­tion started in 1946, and the church was recon­se­crated in 1955. Date of photograph is unknown. Left: A interwar year view of Danzig’s River Mottlau (Polish, Motława) water­front. In the dis­tance is the Gothic double-tower Kran­tor Gate (1442–1444), the best-known symbol of German Danzig. 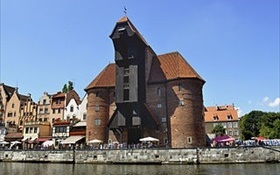 Right: Gdańsk’s Krantor Gate in 2010. In the Soviet assault on Danzig in early 1945, the medi­e­val gate was severely damaged—brick­work smashed and the wooden por­tion that housed the port crane destroyed by fire. Between 1957 and 1959, the gate was rebuilt and today serves as the city’s marine museum.